Have you ever felt lazy or annoyed from feeding your beloved cats for several times per day? Are you a workaholic who is not able to stay in and take care of your cats a whole day? Such things happened for sure, especially for those who adopt multiple children (You know what children we are talking about.) Then why not abandon the traditional pet feeding way and turn to use the so-called automatic cat feeders instead? Keep reading because what you are about to get to know is probably what you have been looking for to help your frustrating routines. 10. Lusmo Automatic Pet Feeder – English Ver. Starting off with our 10th place which is Lusmo. 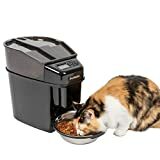 This automatic pet feeder has come with an easy program that allows you to set up time and quantity of the food for your cat daily. The tank is easily removed and washed. Now you do not need to worry anymore if your cat can break in the container to get the food because it also has a lockable cover. Coming to the 9th place is Pet Feedster, which equipped with the modern and advanced program. The product’s most recent add-on to its program included “Meal confirmation” and “Pause mode” which you can only find from this particular feeder. Especially, its smart designed is Ant-proof, so you don’t need to worry about the health of your precious one. Our 8th product is from Animal Planet. This one also provides an automatic program, so it is suitable for any household. At first glance, you will be in love with the surprisingly cute and irresistible design of the product. If you are looking for a small and handy and durable machine, consider this one. Next, our 7th place is, of course, Home Intuition Programmable Food Dispenser. Interestingly, it has an innovative program for parents like you, to set up how much food for your cat and to manage when to feed it. On top of that, the design is eye-catching unique. Own one of this if you plan to keep your baby cat in shape (eat on time). The following product that falls into our 6th place is Crown Majestic. 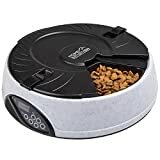 Your pet will love you even more if you choose this machine for them for it has almost all the necessary programming such as setting time and portion per meal, voice alert for your cat, low batteries alert for you. Moreover, it comes with water bowl and bottle which can save you a lot of space. At the moment we have reached our 5th place, and it is none other than Cat Mate. 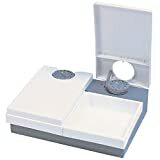 You will find this model designed specifically for wet food because it contains ice pack to keep the food fresh. Additionally, the two bowls can be cleaned in the dishwasher as well. Cat Mate is a genius because the 4th place this time is from the company once again. Spending only 5 minutes to set the time and proportion of meal in advance for your pet, then you will be ready to be stress-free when stepping out of your house. What makes this machine unique is its ‘frequent feed’ mode that allows your pet to eat a little amount of food but many times during the day. No doubt our 3rd place goes to Petnet SmartFeeder. Make sure to enjoy the abundant advantages from this because you can control the program in your palm through your smartphone. This product is “smart” since setting time, portion amount, and receiving notifications about feedings, battery life alert is managed from your smartphone. Similarly, you can track your cat’s meal to be fit with its weight and age. So be sure to pick up this product right away! Please give a big clap for our 2nd place from PetSafe which is considered to be one of the bestselling products. The first impressive thing about this is its flexible program mode. There are many methods for you to set so you can customize the feeding time and amount of food easily. Moreover, it comes with stainless steel bowl which is a good deal. Importantly, you will see that the dispenser is anti-jam so it can dispense food in all shapes and sizes from dry to semi-moist. 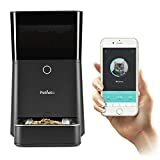 Here comes to the end of our “Top 10 best automatic cat feeder in 2019” reviewing. All the products mentioned have different features and designs. However, we bet that there will be at least three or two that fit with your preference. Above all, let try to take advantage of modern tech and be free from all the frustrated job you have to do repeatedly for your baby.